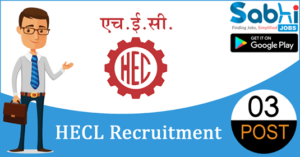 HECL recruitment 2018-19 notification has been released on official website www.hecltd.com for the recruitment of 03 vacancies at Heavy Engineering Corporation Limited. The candidate who is looking for Management Trainee can apply online application from 28th June 2018 and before 18th July 2018. Qualification Graduate Engineering in Mining Machinery with minimum 60% of marks or equivalent CGPA from recognized Indian University/Institute approved by AICTE. Pay the Application Fee through Debit Card, Credit Card, Net Banking. How to Apply Interested and eligible candidates may apply online through www.hecltd.com from 28th June 2018 to 18th July 2018.